Obama says he wants Clinton "campaigning as much as she can"
(CNN) -- Sen. Barack Obama and his wife, Michelle, each donated $2,300 Thursday to the campaign of his former opponent, Sen. Hillary Clinton, which is millions of dollars in debt. Sen. Barack Obama will make his first campaign appearance with Sen. Hillary Clinton on Friday. In addition, Obama's national finance chairman, Penny Pritzker, and her husband donated another $2,300 each, said Obama communications director Robert Gibbs. The $2,300 is the maximum individual contribution allowed. "[Obama] wrote a check himself, as well as his finance chairman, so I got two checks in my pocket for Hillary," said Clinton adviser Terry McAuliffe. Asked how much the checks were for, he responded, "They maxed out." Obama communications director Robert Gibbs confirmed the Obamas' donations. The move comes nearly three weeks after Clinton suspended her campaign and endorsed Obama, the presumptive Democratic presidential nominee. This week, Obama asked top contributors to help Clinton retire her campaign debt of $22 million, about $12 million of which she loaned to her own campaign. The two Democrats met Thursday night in Washington with her top fundraisers. On Friday, they are to appear together at a rally in Unity, New Hampshire, a town on the state's western border where they tied in the January primary. Clinton and Obama endured a protracted and, at times, fierce primary season. After months of divisive contests that took them through every state, the two are focused on uniting their party in order to defeat the Republicans in November. In exit polls conducted throughout the primary season, many Clinton backers said they either would not vote or would vote for Sen. John McCain, the presumptive Republican candidate, should Obama become their party's nominee. Clinton has said it would be a "grave" mistake for her supporters to cast their votes for McCain. "Anyone who voted for me has very little in common with the Republican party. If you care about the issues I care about, and the future that I outlined during my campaign, then you really have to stay with us in the Democratic Party and vote for Sen. Obama to be our next president," she said in Washington on Tuesday. Since Clinton endorsed Obama this month, she has been urging her supporters to follow suit. "The way to continue our fight now to accomplish the goals for which we stand is to take our energy, our passion, our strength and do all we can to help elect Barack Obama the next president of the United States," she said as she suspended her campaign. Obama and Clinton have appeared on good terms in recent weeks. 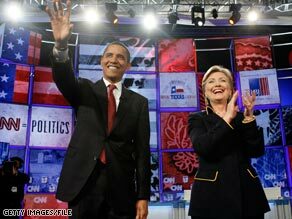 Obama has repeatedly praised Clinton while on the trail. Obama has shied away from any talk of a possible joint ticket, although he's said Clinton "would be on anyone's short list." The senator from Illinois has made it clear, however, that he wants Clinton's help. "I want her campaigning as much as she can. She was a terrific campaigner. She I think inspired millions of people, and so she can be an extraordinarily effective surrogate for me, and the values and ideals that we share as Democrats," Obama said Wednesday in Chicago. "I think we will have a terrific time together in New Hampshire. And I think that she will be very effective all the way through the election," he said. But voters aren't quick to forget what was, at times, a contentious race for the Democratic nomination. Clinton labeled Obama an "elitist" for saying some small-town Pennsylvanians were "bitter" people who "cling to guns and religion" in the days leading up to that state's primary. Obama accused Clinton of acting like "Annie Oakley ... packin' a six-shooter" in her attempts to connect with gun owners.